Urbanz Christchurch i Christchurch, New Zealand: Reservér nu! 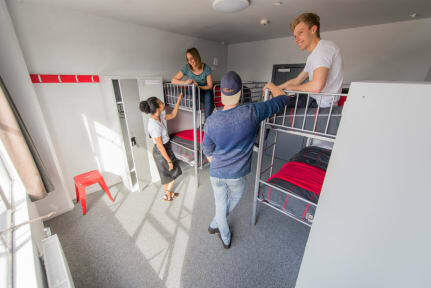 Stay in the centre of Christchurch in our beautifully renovated loft style building - easy walk to all city sights including Cardboard Cathedral, Tram, historic New Regent Street, Avon River, entertainment venues and the best bars and restaurants. FREE UNLIMITED wifi. Onsite bar with cheapest beer in town. Big lounge with pool table, SKY satellite TV, and fireplaces. Very good. Clean tidy & friendly Not been in a hostel for 15yrs . Shocked by how quite all hostels are these days. Every has their head in their phone. No doubt doing reviews. This hostel had a bar which was essential otherwise. Conversation would rarely happen.. Enjoyed my stay. Quite a boring hostel where nobody was talking to each other.